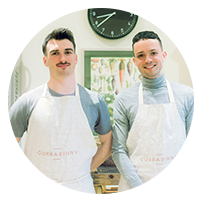 William Murray & James Kavanagh gave birth to Currabinny after a discussion on how they could turn their unwavering obsession (food) into a career. William studied & grew his love of food at Ballymaloe Cookery School in Co. Cork - which is headed up by the duo’s food heroes Darina Allen & Rory O’Connell. In Ballymaloe, William nurtured his love of dishes that are unashamedly created with lots real butter, Maldon Salt & seasonal, fresh vegetables. James comes from the other side of the food world; marketing. Having worked for two of his favourite, Irish brands; Kerrygold & Barry’s Tea, he has learned what goes into making a beautiful product. Witnessing the passion & quality that goes into making a Barry’s teabag and how the perfect grass has to exist in order for Kerrygold Butter to be as delicious as it is, has stuck and influenced his food ethos. A dream come true for the pair, The Currabinny Cookbook is launching in October 2018 and James and William hope to open the first Currabinny Cafe in the not so distant future. Watch this space!